Messages of hope brings messages of hope to people in need of good news. Messages of hope reaches out to more than 1,000,000 people each week in the hope that these messages will heal, give hope and inspire, through the love of Jesus Christ. 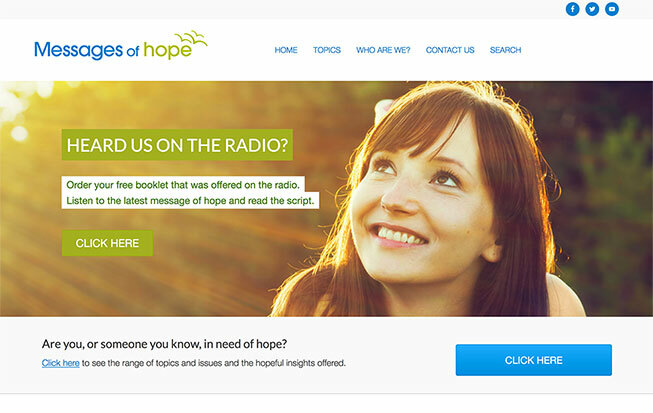 Messages of hope has 15 minute and 1 minute messages that are played weekly on over 700 radio stations. The 15 minute messages include contemporary music and are available at www.messagesofhope.org.au. Also available as a Mobile website. Messages of hope has inspirational pastors, speakers, and people we interview who share stories from real life situations. A related booklet is offered free at the end of the program. These can be ordered by contacting Lutheran Media or ordered from www.messagesofhope.org.au. Lutheran Media produces inspiring Messages of hope movie clips which are available at www.messagesofhope.org.au or at www.youtube.com/luthmedia. They’re interviews of real people who tell their stories so that others may receive hope in Jesus Christ.